Finished at last! All 25 squares! What a huge learning curve! 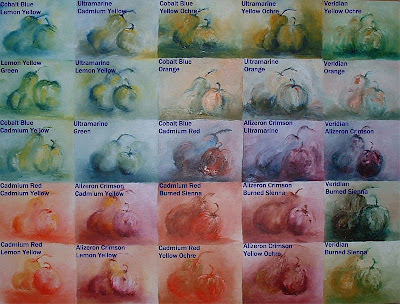 I worked in each square with only two colours plus white and have been amazed at the mixes, especially the beautiful greys one can get. I have also confirmed what my favourite colours are. Thanks Cath. My new teacher is unbelievable!!! We are all well, how are you? Long time no hear! Your painting is amazing -Excellent to see the completed painting. Loved the greyscaling as a test. Will follow suit. Hi Cath - went to see how you doing - wow - I read it three times and will probably go back again.